Juniors have a pep talk before a game starts. Powderpuff football is one of main traditions during homecoming week. Homecoming powderpuff football is a girls only activity, similar to the boys volleyball games. “It gets very competitive, especially in the last years when I played against my sister’s grade with her and all her athletic friends,” says junior Susie Puchino. The event allows all four grades to compete against each other. 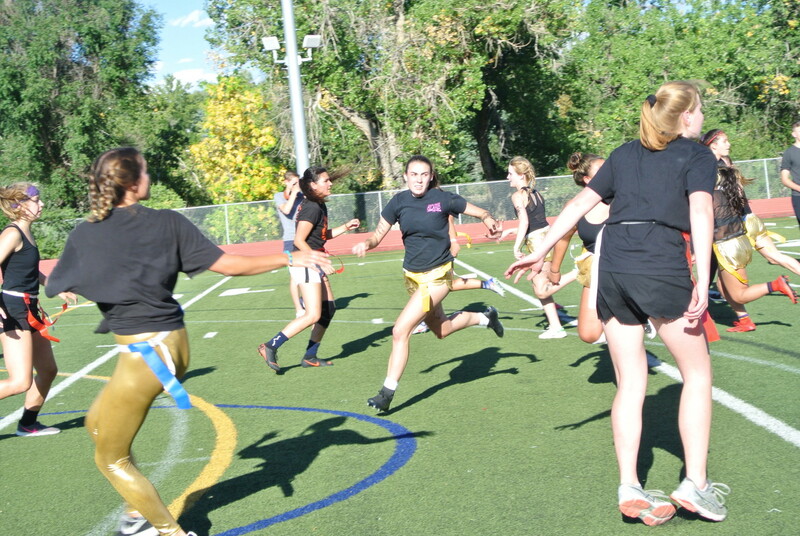 This year’s powderpuff football game was especially competitive, even between the refs. The game referees were as equally energized as the players, making the gamed more intense. This, however, didn’t effect either teams confidence. “It’s really fun, and you make friends with people in other grades. It gets super competitive and everyone wants to show off how good they are at football!” said junior Ellie Fuchs. The group of girls who play love the competition and think the rivalry between the grades makes it a fun homecoming activity. “I think it’s an important homecoming tradition because it’s good competition among the grades, and lets girls do something that we don’t normally get to do,” Fuchs says. “I think it’s an important homecoming tradition because it gets us all in the spirit for the real football game and it’s just a fun way for all the grades to get a little competitive,” said junior Carly Parker. The juniors and seniors ended up winning in a tie. This year student council attended for the winner to be the team who won by the most points during the first game. In the first games, seniors played sophomores and juniors played freshman. The juniors had the greatest point difference during the first game, but the juniors and seniors demanded a sudden death game. 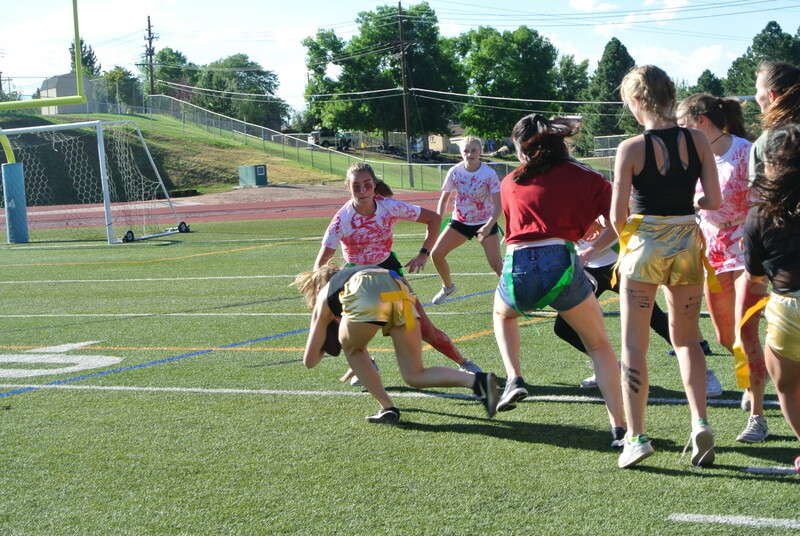 “I think it went pretty good, pretty sure the Juniors won, and then the Seniors just wanted some extra competition with the sudden death,”said junior Mackenzie Schwartz. 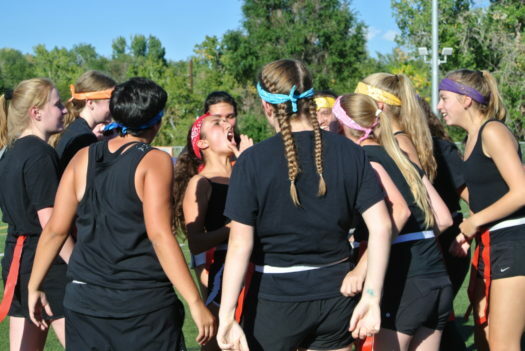 This sudden change caused both the juniors and seniors to get even more competitive. Even with the increased pressure, the game ended with a tie. “I think it went really well. At the beginning I felt like we were just not connected and we were kinda just doing our own thing, but then after they scored one I think we kinda got our act together and really connected as a team,” said senior Alex Ortiz. “People should definitely try to play it so they can represent their grade and people should watch it because having fans makes it more fun,” says Puchino.